The skirt is made of cotton and has an elastic waist for comfort. It will come hemmed at 44" unless a shorter length is provided. The skirt is full enough to fit over standard size hoop skirts (120"). The bodice is made of heavyweight twill or cotton and is fully lined and boned at the lacings to prevent bunching. The bodice laces up through professional-strength grommets. 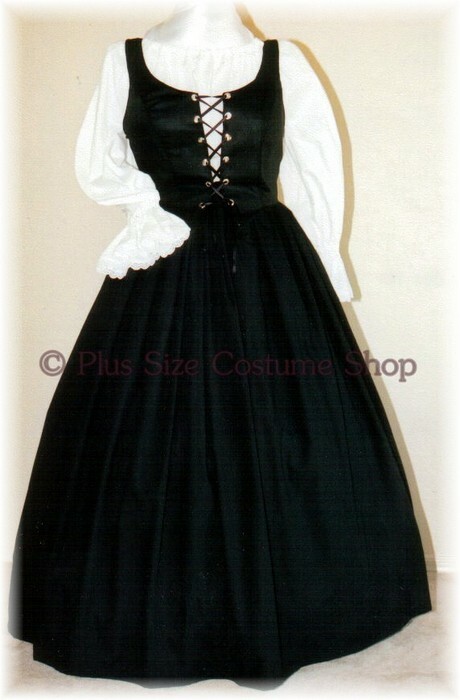 The peasant shirt is made of cotton and has elastic in the sleeves and neckline for a comfortable fit (gothic sleeves do not have sleeve elastic). You may choose long sleeves, short sleeves or gothic sleeves. The length of the peasant shirt is approximately 32" or hip-length. Please specify your color choices for skirt, bodice, and peasant shirt upon purchase. This package is the same as above, but includes an extra solid-colored cotton skirt and a pair of skirt pins. 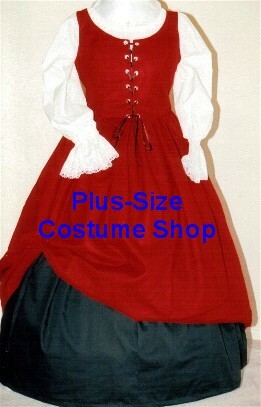 Please specify your color choices for both skirts, bodice, and peasant shirt upon purchase.